After six games of the World Cup qualifying campaign, Northern Ireland, Scotland and Wales fans dreams of heading to Brazil have been thoroughly extinguished. 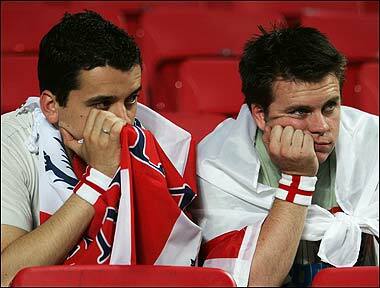 Meanwhile, England are undefeated and currently sit in a playoff place, two points behind group leaders Montenegro. Despite these contrasting fortunes, it is the English players who have been subjected to heavy criticism following the latest round of international fixtures. England are ranked 4th in the world and regularly qualify for major tournaments with ease, the only notable exception in recent times coming at the hands of Steve McClaren and his umbrella. Compare the talent of the English team with such sides as Spain, Germany, Italy, Brazil, Argentina, the Netherlands and several others, and England simply do not have the quality to match. Despite this fact, the English are almost always a fixture in the last eight of tournaments, and would surely have won Euro 96 if Paul Gascoigne had longer legs or if Gareth Southgate wasn’t, well, Gareth Southgate. However, English football is once again in a state of panic, with the promising but far from dominant qualifying campaign joined by controversy over chants aimed at Rio Ferdinand for his decision to withdraw from the squad. Ferdinand was taunted by chants from England supporters at the games against San Marino and Montenegro, with brother Anton also a target for abuse. Many media outlets have reported the chants as racist, as well as a complaint being made to FIFA. I personally do not believe these chants had anything to do with racism, England supporters have abused their own players for many years, with it being almost traditional for the national side to have a scapegoat or hate figure. First it was David Beckham, who returned from the 1998 World Cup to baying hoards, after his red card against Argentina contributed to the teams exit from the tournament. 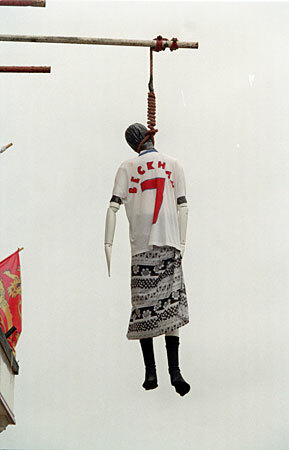 He was booed by every set of opposition fans in the country, with some going as far as hanging an effigy of the forlorn midfielder from a pub in London.It was not until Beckham’s famous free kick against Greece that sent England through the next World Cup qualifying campaign that he was forgiven, with chants and abuse of Beckham relating to that night in France lasting for many years. Phil Neville was the next man to be ‘welcomed’ back in style after a costly mistake at a tournament, he was responsible for the foul which allowed Romania to eliminate England from Euro 2000, with a (literally) fiery reception upon his return. It is alleged that as Neville arrived back home following the tournament, the gates of his house had been set on fire. David Seaman was the next man in the firing line, with abuse and mocking chants for the remainder of his career after Ronaldinho beat the Arsenal and England stopper from long range to win the game for Brazil. “Let’s all do the Seaman” followed by wildly waving arms was a popular sight at many football grounds in the immediate aftermath of that particular tournament. Seaman is far from the only England goalkeeper to receive excessive criticism, and it may actually be easier to list those who haven’t become a public enemy at some point. 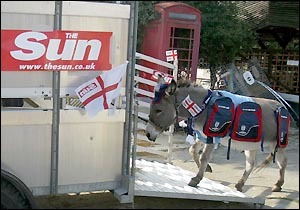 David James was targeted by a campaign from The Sun to replace him in goal with a donkey, after a number of errors while wearing the Three Lions shirt. Mavis the donkey was taken to Poland by the tabloid newspaper and offered to coach Sven Goran Eriksson as an alternative. The tabloid torment for England goalkeepers kept on coming over the following years, with Paul Robinson and Scott Carson getting both barrels for mistakes made in the two games against Croatia, leading to England failing to qualify for the 2008 European Championships. Continuing on a now familiar theme, the entire England side were booed off the pitch in South Africa after a dismal 0 – 0 draw with Algeria, with Rob Green another goalkeeping scapegoat after a spectacular error in the first group game. England were leading the United States 1 – 0 (with the ITV commentary team declaring “this could be fun” after the goal), when Clint Dempsey’s weak and bobbling shot was somehow allowed into the net. Following the booing after the Algeria game, Wayne Rooney delivered a foul mouthed tirade into a television camera. This should probably come as no surprise, Wayne Rooney would almost certainly use at least four profanities to describe a puppy eating an ice cream. England did eventually qualify for the knockout stages of the tournament, but three poor performances and scraping through in second place made a mockery of the now infamous EASY front page of The Sun. There is no doubt that England should have expected to qualify from this group when it was drawn, however this kind of arrogance from a nations media before a tournament cannot be healthy for expectations. Every nation that qualifies for a World Cup deserves respect, with players raising their game as they take part in some of the biggest games of their lives. Is it possible that the overconfidence displayed by The Sun and the other tabloid papers found its way into the team camp? Even if the players themselves were not affected, it certainly convinced many English people that the Three Lions would merely have to turn up in each of their group games to collect three points. As it was, England lost 4 – 1 to Germany in the last 16 and exited the tournament after four games and no convincing performances. 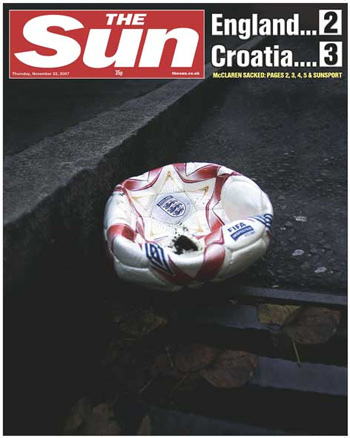 It is my firm belief that the attitude of The Sun and other tabloid newspapers in England has been far more detrimental to the success of the Three Lions than a red card in France or an umbrella at Wembley could ever be. The English football team is not allowed to be average. They are either an all conquering team of legends, or a shambling disgrace of a team who have shamed a nation. The media ensures that every England win is a heroic step towards glory, while every defeat is a sign that English football is plunging to new depths. The actions of these papers and other such media crosses over to the followers of England. You may notice that I use the term ‘followers’ rather than supporters, as the fans who travel to watch England are generally very good. They may throw the odd plastic chair at someone or streak in a fountain, but in general they travel with excellent numbers and noise. The followers I am referring to are those who dig out their Wayne Rooney shirt every two years, while telling anybody unfortunate enough to be in the same room as them that Gareth Barry and Michael Carrick are both rubbish. These people have heard someone at work say that Gerrard and Lampard shouldn’t play together, and they therefore repeat this mantra at ever increasing levels of volume and outrage. He will chant ‘Ingurlund’ and shout at anybody in the pub who looks a bit foreign for the ‘banter’. Eventually, England are eliminated from the tournament and he will will snap the miniature St. George’s cross off his Volvo. He thinks football is crap anyway, and has always said rugby is a proper mans game. It is this type of person that cause such scenes of celebration across the rest of the United Kingdom and Ireland when England are inevitably sent packing from a tournament. It could be argued that the actual England fans deserve a successful team, unfortunately for them this is far outweighed by the infuriating bandwagon jumpers. These casual observers of England and their nonsensical opinions are also responsible for many English people choosing their club over their country, seeing the international break as a inconvenience rather than something to anticipate. Things are not helped by the ridiculously bad coverage provided by ITV, with a prime example being the aftermath of England being eliminated from the 2006 World Cup by Portugal. Ian Wright was so cross that someone dared to beat England he refused to speak at all, while Alan Shearer suggested that Wayne Rooney should assault Cristiano Ronaldo when they returned to training at Manchester United.Then of course, there is everything Adrian Chiles says and everything Adrian Chiles does. A man so staggeringly lacking in football knowledge or anything interesting to say whatsoever, I can only assume he won his job from the back of a cereal packet. The average England fan at an away qualifier or a tournament does not expect the team to stroll to World Cup glory, beating Spain 5 – 0 in the final. Unfortunately, ITV and the tabloid media creates an army of these people, the most deranged of these then taking to social media to racially abuse players and send death threats to referees. For England to even hope of recreating their success from 1966, there are three main changes that I believe have to be made to catch up with the nations who consistently challenge for international silverware. 1. Don’t let the tabloid press run the team. The ‘build ’em up and knock ’em down’ mentality of the English press has gone on for far too long. It has cost the team points, players their positions and managers their jobs. It has also raised expectations to unrealistic levels, adding to the pressure on the squad and the resulting criticism when inevitably, these ambitions are not matched. The press need to be more supportive of their side if they truly want to see them do well, with no repeat of the headlines mocking Roy Hodgson’s speech before the 2012 European Championships. 2. End the Premier League myth. Does anyone really believe that the Premier League is the best in the world anymore, apart from Sky Sports? This may have been true several years ago, but the Bundesliga and La Liga have long overtaken the Premier League, with Germany in particular winning plaudits from all over the world for the way the league is run and the respect shown to fans. Germany have performed well at the last three World Cups, finishing as runners up once and twice taking third place. Meanwhile, the success of Spain in recent years needs no introduction, the European and World champions winning the last three major tournaments they entered. The Bundesliga in particular tends to focus on homegrown talent rather than bringing in foreign superstars, and for every imported Messi, Falcao and Ronaldo in Spain, there is a Xavi, Iniesta and Iker Casillas. 3. Banish Adrian Chiles from the country. I attended my first Wales game as a 6 year old in 1996, as San Marino were trounced 6 – 0 by a Welsh side which included Chris Coleman, Mark Hughes and Gary Speed, three future managers of the country. At this age I had no concept of how ridiculously terrible San Marino were, and was convinced for a short time that Wales must be utterly brilliant at football. Sadly as I grew up, I realised that supporting Wales was going to involve a whole lot of disappointment, with the occasional moments of brilliance to make it all worthwhile. Many people appear to be viewing the English national team with the mentality of a six year old, getting incredibly carried away when they win, and throwing excessive tantrums when they lose. 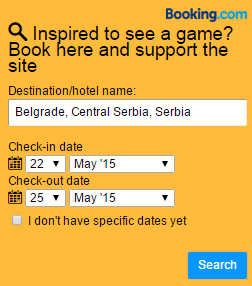 Greece winning Euro 2004 was proof that international success is not just about great players. Hard work, team spirit and togetherness are just as important, something which is sorely lacking in England with the many divisions within the Three Lions. Before England can even start to focus on winning trophies, they first need to win the battle over themselves. Posted on April 2, 2013, in General and tagged England, England football, England national team, Rio Ferdinand, Rio Ferdinand racism, San Marino, World Cup, World Cup 2014. Bookmark the permalink. Leave a comment.